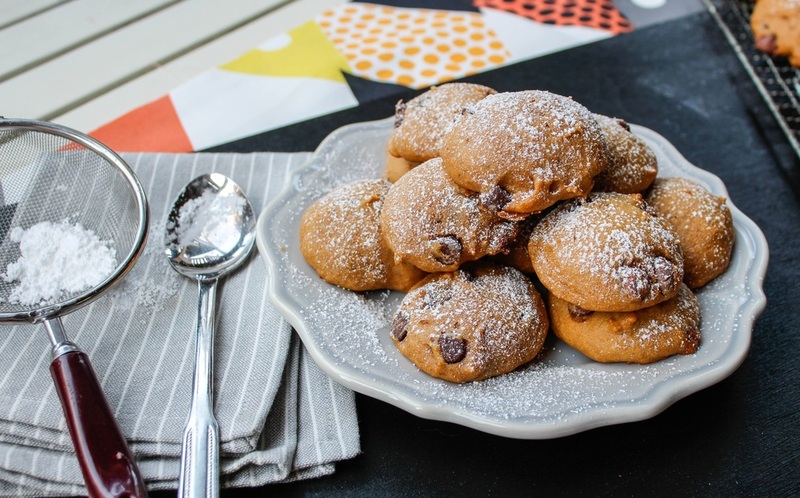 festive holiday recipes: pumpkin chocolate chipsters — Mel bakes things. And we're off with holiday recipe #1! Like I mentioned last week, this week I'm starting a holiday recipe series that will hopefully serve to give you some baking and gifting ideas for the upcoming holidays (Halloween through Christmas, I'm thinking). The word "chipster" makes me think this cookie is like, extra hipster. Just roll with it. Texturally, these are more cake than cookie -- soft and fluffy, but they are cookie-like enough that they're structurally sound (they won't fall to pieces the minute you take a bite). The pumpkin flavor really shines through, and the spices are vibrant, but not overwhelming. I swear I just heard a dial-up internet sound coming from somewhere in my office building. It's still 2013, right? Ok, just checking. Stir the flour, baking powder, baking soda, salt and spices together in a medium bowl and set aside. In a large bowl, using an electric mixer on medium speed, beat the eggs and sugar until smooth, about 1 minute. Stop the mixer and scrape the sides of the bowl as needed during mixing. On low speed, add the the oil, pumpkin, and vanilla and mix until blended. Add in the flour mixture and incorporate. Mix in the chips with a spatula/spoon. Bake the cookies one sheet at a time until the tops feel firm and a toothpick inserted in the center comes out dry, about 16 minutes. If you use smaller scoops, just keep an eye on your cooking time. Mine took around 12-13 minutes for the smaller size. Cool them on the baking sheet for 5 minutes, then use a spatula to transfer the cookies to a wire rack to cool completely. Dust the completely cooled cookies lightly with powdered sugar. If you’re not going to serve/eat these immediately, I would suggest you sprinkle the powdered sugar on the cookies right before serving/eating. The moisture in the dough will cause the powdered sugar to disappear over time.